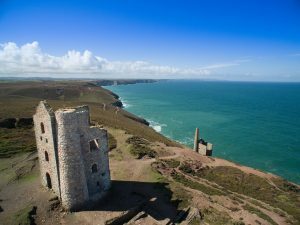 In the latest of our ‘spotlight’ series, we take a look at the magnificent county of Cornwall for your next hot air balloon experience. Known for its fishing boats, seafood and being a reputable surfing destination, Cornwall is the ultimate paradise for those who love the coast. With balloon flight meeting locations in East Bodmin or Launceston, Aerosaurus cover from North to South and East to West of the county. Capture unmissable views and diverse history with a spectacular hot air balloon ride in Cornwall in 2019. Did you know that one third of Cornwall is in fact an Area of Outstanding Natural Beauty? This corner of the UK is a hive of activity throughout the year and attracts millions of people to its beautiful coastal and country towns and villages. As Landscapes for Life, in partnership with The National Association of Areas of Outstanding Natural Beauty. says: The AONB [in Cornwall] protects many important natural and historic sites. This is why Cornwall makes for such a popular destination for hot air balloon rides in the South West. With so much to explore from the skies above, it is no wonder why people come back to create memories with friends and family, time after time. Tucked into the Cornish Border as you drive through from Devon, Launceston is the first historic town most individuals would pass to get to their destination in Cornwall. The architecture you see from ground level is just as distinctive as the sights you will see during your balloon flight; from ancient ruins to the 11th century castle and Launceston Priory, there is so much to explore in the quaint, charming town. But the sensational sights don’t stop there. Launceston is one of two excellent balloon location sites which we are delighted to explore with you at Aerosaurus Balloons. 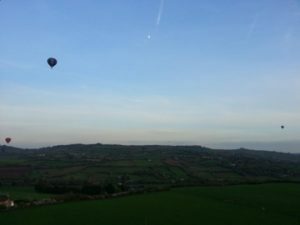 When you choose a balloon flight near Launceston, you will have panoramic views of Bodmin Moor, Dartmoor and even the Atlantic Coast. The second of our two Cornwall balloon ride locations is the biggest town and capital of the county, Bodmin. This vast area of land offers the most magnificent views to the south of the county, heading out to the Celtic sea. This conveniently placed launch and landing site allows you to see outstanding focal points when airborne, such as: King Arthur’s Tintagel and the popular surfing destination of Newquay. You can’t forget the popular coastal destinations of Padstow and Polzeath to the north of the county and St Austell, Fowey and Polperro to the south, which you can see from your balloon basket. Close to Bodmin itself, there are hundreds of acres of unspoilt land surrounded by prehistoric and medieval remains – a sight to behold for the archaeological fans in the basket! Spring is just around the corner and it’s the perfect opportunity to take advantage of the beautiful weather this time of year brings, so why not take a look at our fantastic range of flight vouchers, with each and every one providing a unique ballooning experience. For more information on our Cornwall flights, or to talk to one of our experienced team members, contact please contact our office on 01404 823102 or email: mail@ballooning.co.uk. We look forward to flying with you soon!